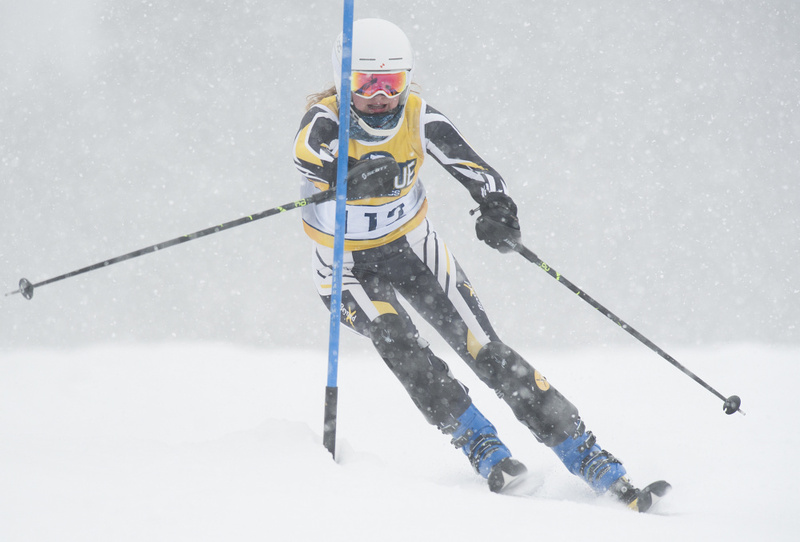 Black Bears, Cougars battling for Alpine and Nordic crowns, to be settled Tuesday. 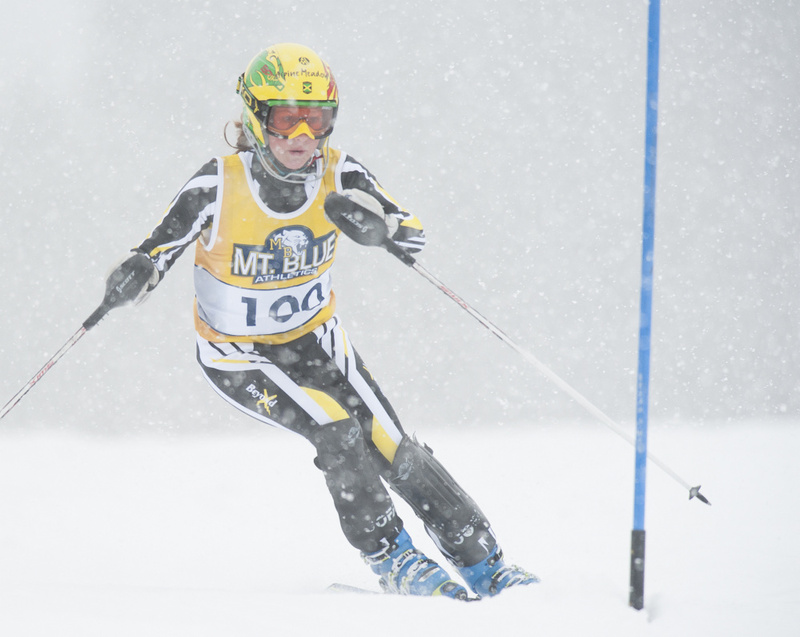 FARMINGTON — The snow showed up early and lingered throughout the day, blanketing Titcomb Mountain with one white layer after another just in time for the Kennebec Valley Athletic Conference and Mountain Valley Conference skiing championships. Miles Pelletier and Rachel Tooth didn’t seem to mind. 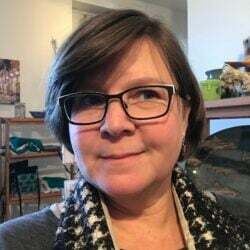 Pelletier and Tooth led the Mt. 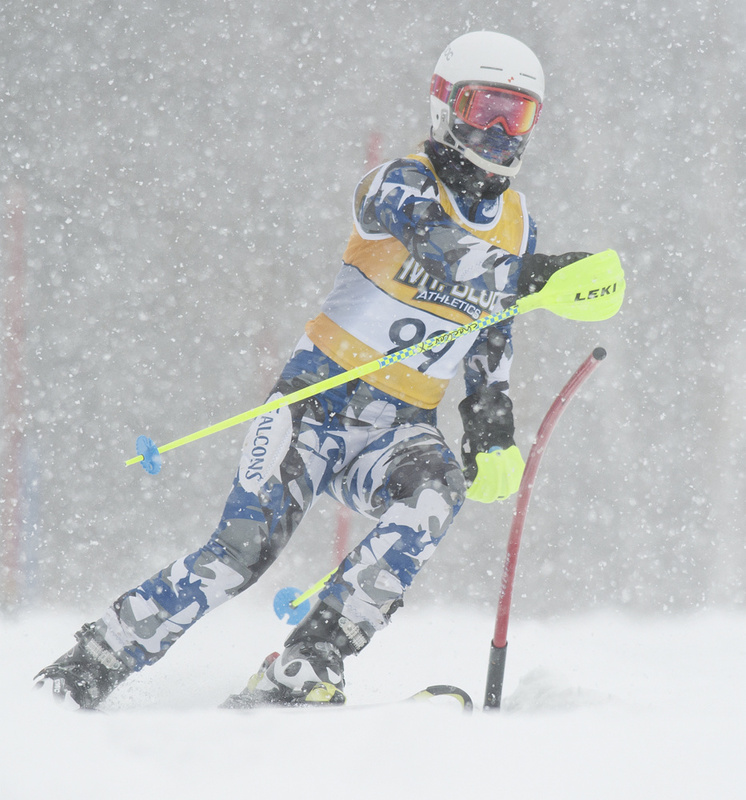 Blue and Maranacook Alpine teams, respectively, with KVAC slalom victories at the Farmington peak Saturday morning and afternoon in the first day of the two-day conference championships. 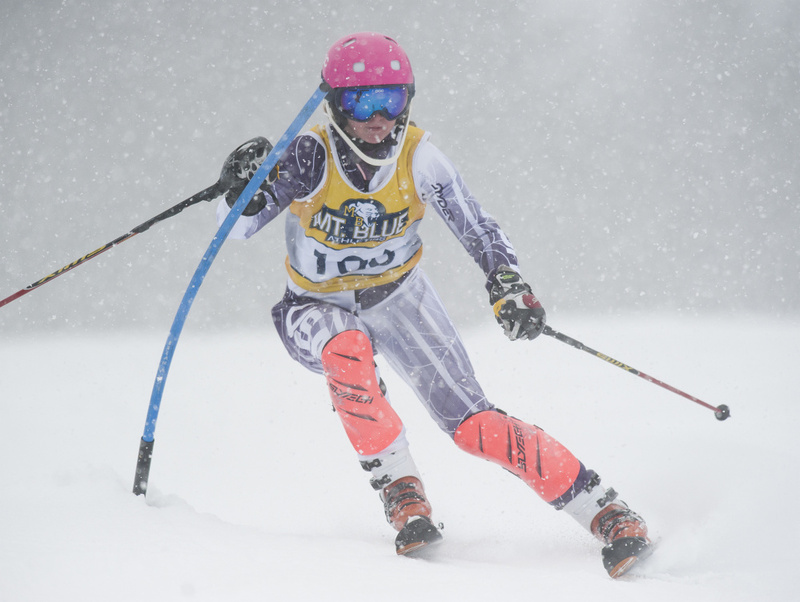 The champions will be decided, weather permitting, after Tuesday’s giant slalom session at Black Mountain. 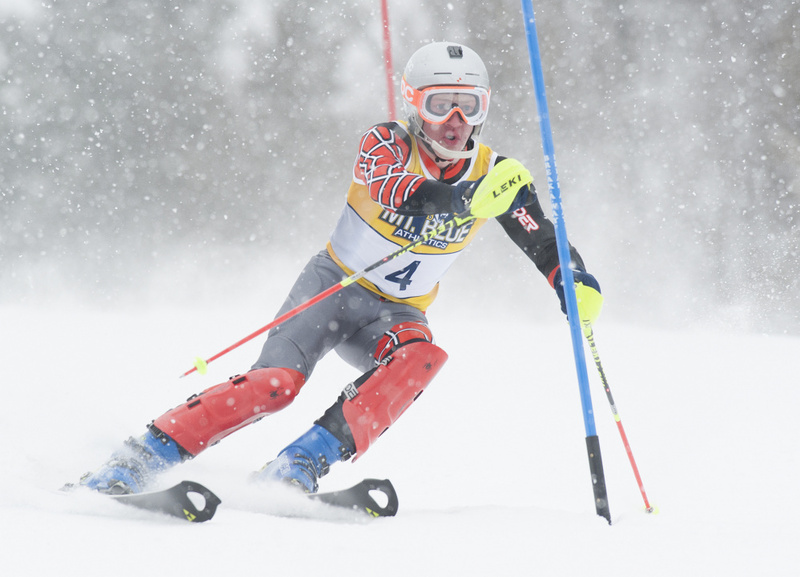 With Pelletier’s victory — he was the second-fastest skier of the day, bested only by Nick Newman of MVC member Mountain Valley — Mt. Blue emerged from the first day in contention for the KVAC title with 46 points, trailing Maranacook (42) and Oxford Hills (44) and coming in ahead of Edward Little (58) and Camden Hills (81). 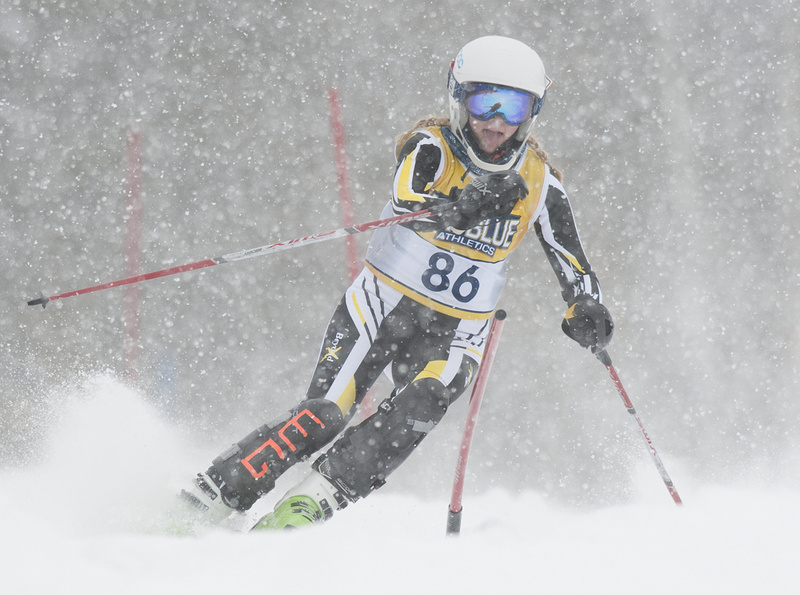 Tooth’s first-place finish — both in the KVAC and overall — led Maranacook to second in the girls’ Alpine with 51 points, behind Camden Hills (23) and ahead of Spruce Mountain (60), Hampden (66) and Mt. Blue (98). 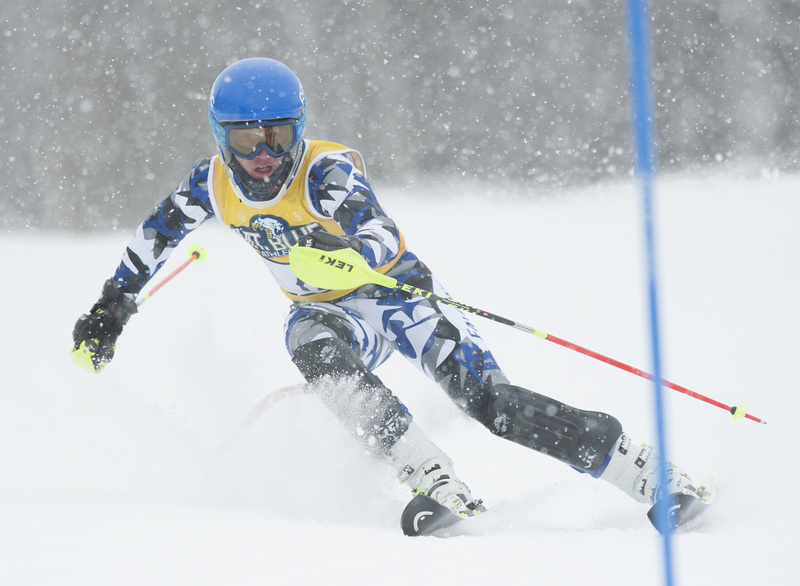 Mountain Valley took the top four spots to sweep the MVC boys’ slalom. Mt. 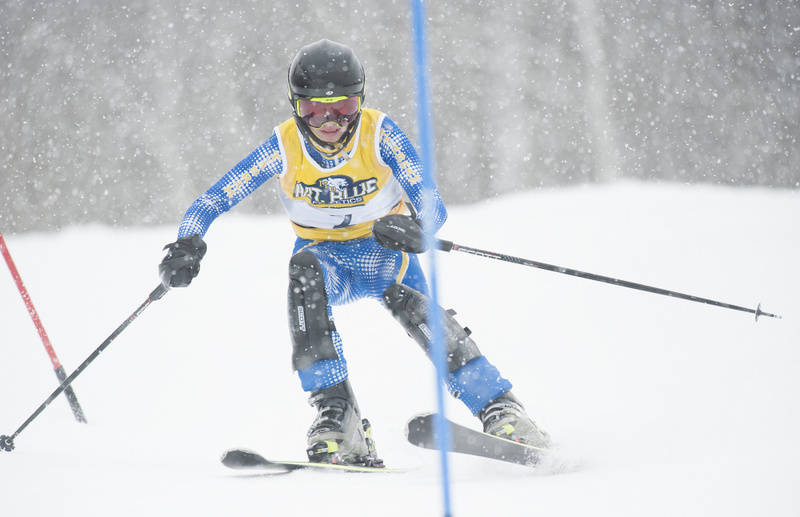 Blue’s Tucker Barber won the boys’ classical race, leading the Cougars to a first-day tie with Maranacook at 22 points. 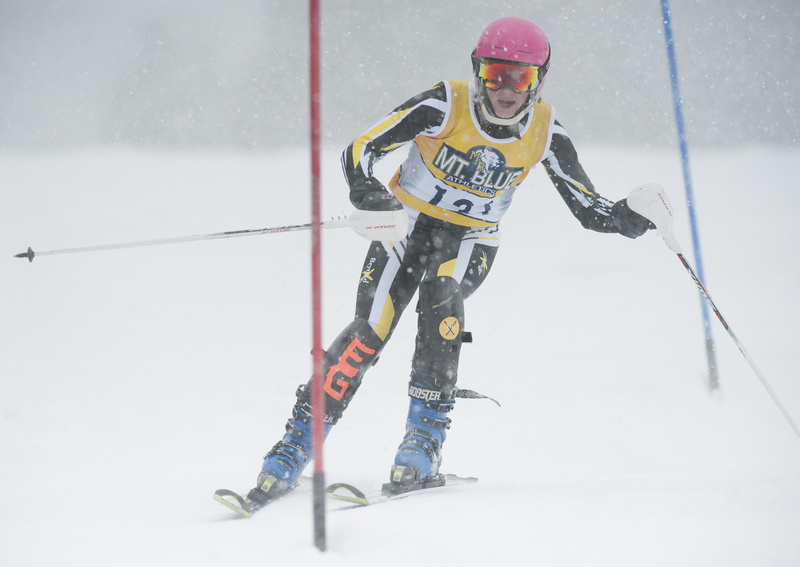 Maranacook’s Laura Parent won the girls’ race, putting the Black Bears in second at 22 points, one behind Maranacook. 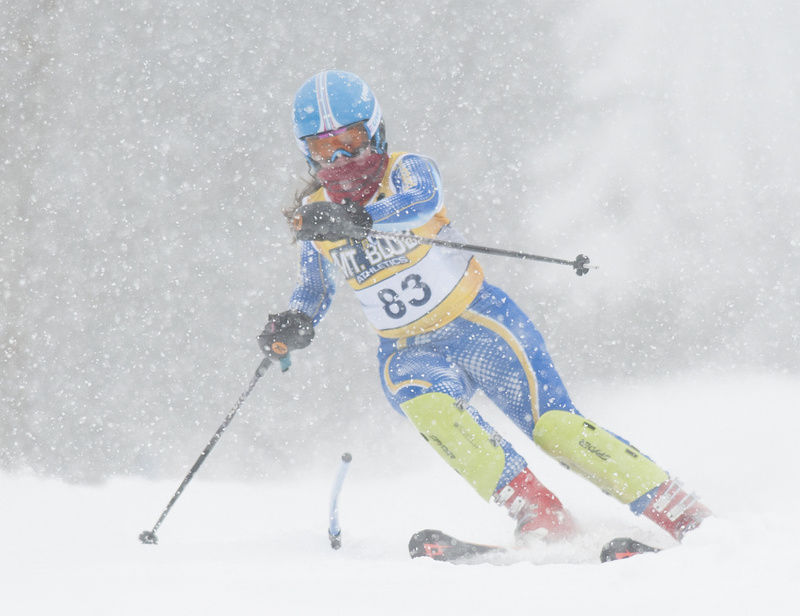 Nothing’s decided in either sport — Nordic is resolved Tuesday with the skate races — but on the Alpine side, both Mt. 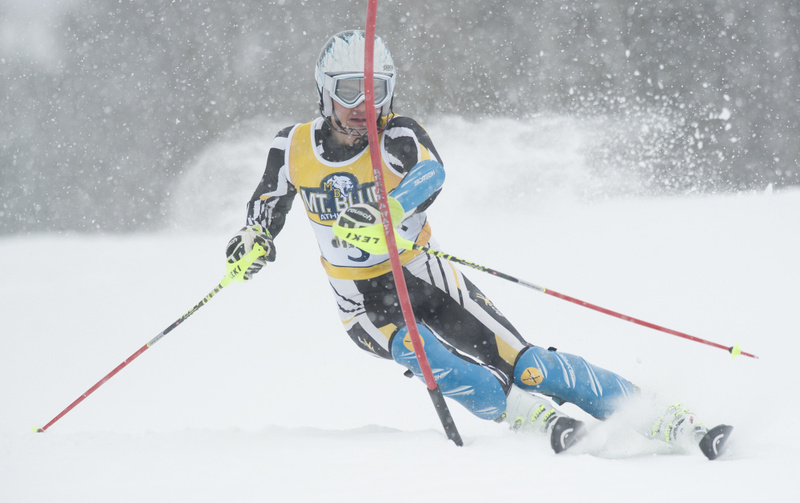 Blue’s Mark Cyr and Maranacook’s Ronn Gifford were pleased with the efforts of their teams to set up a finish with Oxford Hills that could come down to the last skier. It’d be hard for them to perform better than Pelletier did. 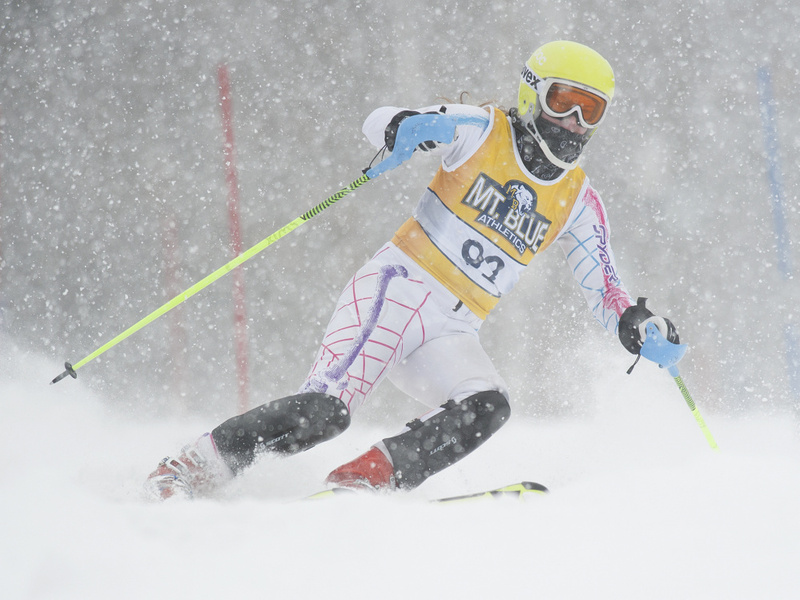 The senior was the fastest KVAC skier on the first run and second-best on the second, en route to a combined time of 1:21.01. He was followed on the team by Hunter Bolduc (third, 1:22.70), Eli Yeaton (seventh, 1:25.20) and James Guillaume (31st). 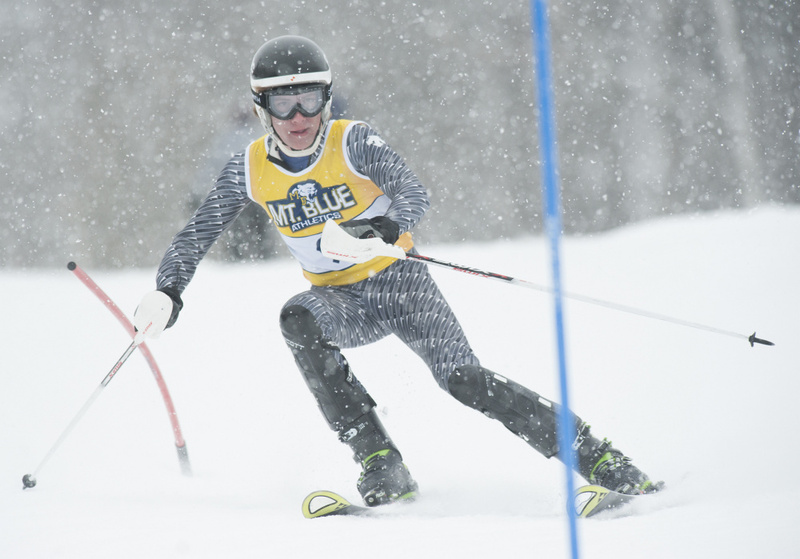 Maranacook was led by Nathan Delmar, who was the fastest on the second run en route to a combined time of 1:21.93. He was followed on the team by Robert McKee (ninth, 1:25.93), Liam McNamara (15th) and Dennis Chiappetta (16th). On the girls side, Tooth was fastest on both runs on her way to a combined time of 1:24.36. She was followed by fellow Black Bears Katie Ide (ninth, 1:33.41), Janika Pakulski (18th) and Vita Scott (23rd). There was no catching Camden Hills, which had four of the top 11 finishers to set itself up perfectly for Tuesday. Mt. 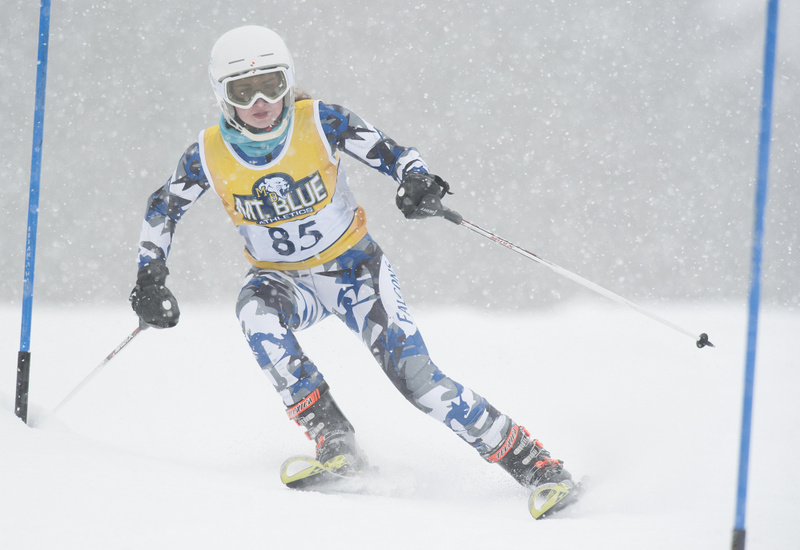 Blue was led by Mazie Gordon (17th), Katie Brittain (21st), Ashley Wiles (27th) and Ellie Pelletier (33rd). In Nordic, Barber (19:54.6) was followed on Mt. Blue by Sam Stinson (fifth, 21:03.6), Isaiah Reed (seventh, 21:25.9) and Nolan Rogers (ninth, 21:32.8). Maranacook was led by Zach Holman (second, 20:18.4), Luke Bartol (21:02.5), Mark McLaughlin (sixth, 21:23.9) and Carter McPhedran (10th, 21:33.0). On the girls side, Parent (24:32.1) was followed on Maranacook by Abby Despres (third, 25:23.8), Maddie Taylor (eighth, 26:35.5) and Maura Taylor (10th, 27:18.1). Mt. Blue was led by Julia Ramsey (second, 25:17.2), Meg Charles (fourth, 25:32.2), Chelsea Seabold (sixth, 26:13.3) and Zoe Huish (ninth, 27:04.7).